Many businesses find that buying backlinks is often much easier than having to naturally acquire them. It offers a faster way of building your link profile – but is it really worth it? We run through the risks and how to earn more natural backlinks in an SEO friendly way. 1 What is a backlink? 2 Why are backlinks important? 3 How many backlinks do I need? 4 Can you buy backlinks to improve your ranking? 8 Is it just backlinks that will improve my website ranking? Backlink is a term used to describe incoming links to your website. Backlinks are great as Google uses backlinks as a ranking factor, helping you rise up the search results pages as a credible website. Backlinks are also great as they also generate referral traffic, i.e. people click the backlinks on the websites where they are cited and visit your website as a result. Search engines want to churn up the best results and provide end-users with whatever it is they are searching for. The point of backlinks and link building, in general, is so search engines can assess the quality of the webpage. The more webmasters are directing their readers to a webpage is a good indication the website offers value. Essentially, an increase in traffic has huge potential to improve your search engine ranking and increases your chances of acquiring new customers. Providing you are publishing engaging content and have a great product you can expect to benefit. Even no=follow links drive traffic to your website and can have as much impact on your search engine rankings as natural backlinks. Backlinks even have a part to play in your business’s branding. The more your audience sees your brand being associated with certain keywords, you’ll be able to help them familiarise your brand with those keywords and help to establish yourself as being an expert in a particular field or industry. The more they see your authority and presence in a field or industry, the more likely it is they’ll trust you. Online business owners simply cannot afford to omit link building strategies from their SEO efforts. The number of backlinks that you need depends on your specific goal. If you simply want to get your site ranked, you can achieve this with only a few backlinks. But this will likely be for low competition keywords and it won’t attract a lot of traffic to your website. However, if you want to rank on top of Google’s search engine results for competing keywords, you need as many backlinks as possible. There is not one answer for how many backlinks a site should have since no specific number of backlinks will work for everyone. It depends on your business, your specific goals, the industry you are in, etc. As a rough guideline, if you are a small business, you can start by looking at 40 – 50 backlinks to give you a good start for your first few keywords. Your total number of backlinks should not be a set target. It should rather be an ongoing process to gradually build your backlinks as much as possible. Even if you do reach the top of Google for a specific search term, you should not stop building quality backlinks. The moment you stop building links you’ll give your competitors and they might just outrank you. A good guideline to follow is to research your competitors and see how many backlinks they have on average. This will help you to get an idea of what you should aim for if you want to outrank them for a specific keyword. You can even see how many backlinks point to a specific page on their website, to see which pages rank best within results. Matt Cutts from Google Webmasters talks about how many links you should use in your website. Can you buy backlinks to improve your ranking? Years ago, it was the number of backlinks and not the quality and relevance of backlinks that helped you establish your website in search engines. Due to that fact, people were gaming the system and selling 100s of backlinks to your site from fake websites or link farms set up purely to link out. Google eventually caught up with this practice and this update was known as the Penguin update (Google names all of its major updates), which demoted sites that had bought-in a lot of low-quality backlinks. Buying good quality backlinks can sometimes generate more income than the cost of the link itself, which is why some business owners consider it a good investment. But unfortunately, this is very risky. Google clearly states that it’s against their guidelines to buy backlinks to improve your rankings. If it’s found that you are guilty of taking part in this practice, Google may penalise you. This is never good as the consequences can be devastating for your business. You will lose your valuable rankings and this can continue for up to six months. In fact, it’s a well-known fact that some websites never recover from this setback at all. Since Google clearly dominates the search market online, it’s in every webmaster’s best interest to avoid buying backlinks at all costs. Matt Cutts from Google Webmasters outlines Google’s policy on paid links. The irony is that even paid backlinks can work wonders. A lot of businesses do it, especially those in competitive industries. They’ve gained good rankings because of it, and haven’t been penalised for it yet. One reason may be that there are literally billions of links all over the web and it’s often not easy for Google to differentiate between natural backlinks and ones that were paid for. Most times, paid backlinks look exactly like natural links on a website. High quality backlinks can be very expensive, which is why people are often tempted to buy the affordable options. But this often means cutting corners and getting links on substandard websites. Low quality links will likely not benefit you at all, and are often a waste of money. Some low quality paid links will also link to unrelated sites or dodgy industries like pharmaceuticals and gambling. This is where Google can easily pick up that you are involved in bad practices and you’ll very likely get penalised. Under no circumstances should you think it’s acceptable to pay for backlinks, especially not the low quality kind. However, if you do have an opportunity to purchase a good quality backlink from an authoritative website, you should know that there are risks involved. You need to be prepared to take responsibility, should Google decide to penalise you. These links can provide great value for your rankings, so it’s understandable that webmasters find it so tempting. Competitor backlinks are the backlinks of rival websites which, if analysed and used properly, could help you develop your own site’s backlinks. Our guide will help you uncover your competitor’s backlinks and potential website’s to get in touch with to have your own site featured. 1. Who are my organic search competitors? First things first, you need to understand who your competitors are. And they may not be who you might immediately think of. It is often assumed that your competitors online are the huge, established brands in the industry, but that can be misleading. Imagine a keyword like “fast food”, the companies that come to mind probably included the likes of McDonalds, Burger King, or KFC, all of which are established, giant corporations. However, if you head over to Google and search for this keyword, you’ll most likely find that they aren’t necessarily listed on the first page. The take away from this is essentially understanding who your SEO competitors are. They are not necessarily the biggest players in the field. 2. What backlinks do my SEO competitors have?For this walkthrough, we’re going to find competitor backlinks by using SEO SpyGlass by Powersuite. 3. Which websites will link to my website?Using the same software, you’re able to identify domains that could potentially link to your website. This can be achieved by establishing which domains are giving your rivals their competitor backlinks. In Domain Comparison, find the Link Intersection option. After the assessment and collection of backlinks, you’ll be presented with the data. Sift out the websites that link to your competitors (these are likely to link to you). Do this by choosing Potential backlink domains under the Help tab. Head back to the backlink domains you collected; copy and paste them into the space provided. The software will collect the email address for the individual domains (if available). You should never stop building backlinks – naturally. It will increase your organic search results and improve your overall rankings. Especially if these links come from reputable sources. The best way to earn natural backlinks is to write great content other publishers will link back to. But the key is to publish content other writers need to link back to. Most content writers embed outbound links to industry news, statistics or relevant information that supports the point they want to make. Consider the type of content other bloggers are publishing and write an article or produce statistics that will support trending topics within your industry or fringe interests. This does not always have to be written pages; you can include a variety of content types like articles, tutorials, how-to guides, infographics and more. You could even try approaching a blog owner with a piece of content you have written that supports a point they are making in their own content. If you compliment their work and highlight you share their thoughts, they will be more inclined to embed your URL in their content. Do a little research and find out who is linking to your most important competitors. Find out what content they are linking to, and why they are linking to it. You can create similar content that is higher in value, so you can attract similar websites. Contact the website and ask them whether they want to link your newly created content. Search engines are looking for reliable partners. To do this they use trust and authority metrics to assess how much value content on your website offers end-users against specific search terms. By positioning yourself as an expert in your field, you will earn trust and authority from internet users. Some publishers will give you backlinks, others will share your content, all of which exposes you to a wider audience. Search engines will pick up on this activity and increase your trust and authority scores – thus you will earn higher page ranks. But the more visible you are online the more backlinks you will receive. To position yourself as a specialist, you have to be writing high-quality content that offers value to readers. You should be doing this on your blog as a matter of course. But also write for third-party sites. We will discuss specific opportunities for doing this later in this article, but as a starting point, look to contribute to respected industry magazines that have a strong following. Although these publications are only permitted to provide no=follow links (links that do not count towards your SERPS) they do raise your online profile and can drive traffic. Influencers are bloggers that have authority and a large following in your industry. You can find them through search engines and social media networks. Leaving intelligent comments and complimenting the work of influencers on a regular basis will raise awareness of your existence. You don’t want to be like Dolores Claiborne, but you do want to get noticed. When the time is ripe you could send the influencer a private message highlighting a piece of your content they might be interested in. If your content is good enough, they may even follow your blog and post your content on their social media accounts. Another, quicker, approach to capture the attention of influencers is to write an opinion piece of the best blogs in whatever subject and link back to their website. You can then get in touch with said influential targets, either through social media or email, notifying them of your piece and asking whether they might be interested in posting the link on their website. Bingo – a backlink from a high-authority domain. It is human nature to have a sense of self-worth, so when you approach an influencer you admire, they will probably agree to an interview and include a link to the piece from their website. At the very least they will post the content on their social accounts. From an influencer point of view, the purpose of giving an interview is to gain more exposure, so you must have a reasonably strong following to make it worth their while. Social media networks are a must for digital marketers and are a great platform to drive traffic. Your profile should naturally include a link back to your website and take every opportunity to direct traffic to your content or product pages. People often copy content from other sources online. It easy and affordable way to populate your website with great content. Unfortunately, having copy content can be risky. There are many ways to determine whether or not someone has copied the content from your website. You can simply do a Google search for a specific sentence from one of your content pages. It will show you a list of sites in the results that contain your content. If they are using your content without permission, tell them that they can continue using your content, as long as they credit you with a link back to your website. You can contact a list of relevant websites and blogs, and ask them if you can publish content on their website. They will get free content that is valuable and of high quality, but in return you will need them to publish a link back to your website. This is often referred to as guest posting. Just make sure that you don’t ask your competitors to publish content on the website. Reverse guest posting is not guaranteed to earn you a followed link, but at the very least it is a good tactic to drive traffic to your website – and earns you a piece of free content from an authoritative figure. The sequence involves asking influential bloggers or experts in your field to contribute content to your website in exchange for a backlink to their website. Some bloggers may include a backlink from their website, but in doing so cancels out their link as “link sharing” is one of the rogue tactics Google outlawed years ago. However, they will probably share the content on their social media account which will earn you a backlink and drive traffic. They may even link to the article from another third party site they contribute towards. When you publish content on your blog it adds weight in search engines if you include links to third party sites. And when you do there is the potential to pick up a backlink. Online businesses will seize any opportunity they can to raise their online profile and reach out to readers with fresh content. They are therefore likely to be inclined to post your content on their social media accounts. This will naturally drive traffic to your website and a portion of those new visitors may use your content to link back to in their own posts. Another great way to get people to link to your site is to create your own videos, instead of written content. You can publish them on your website to attract links, and you can also upload them to various video sharing website. This will give you additional back links to your website. Choose a topic that is relevant your industry, and provide as much value as possible within the video. Infographics have become very popular recently. They provide a great visual appeal to websites, and is a wonderful way to add variety to the additional written content. You can create infographics a wide variety of topics, and you can also submit in various infographics directories. This will help you to get back into the website, especially if you allow others to publish your infographics with a credit to you. You can use your existing business relationships to help build links for your website. If they are one of your suppliers, try asking if they can link to your website, and in return write an article about them or give a review. If it is a customer of yours, you can offer them the possibility of exchanging links to each other. These will be relevant links, as it will be similar to your industry and related to your specific business. Online businesses rely on authentic word of mouth advertising to promote their company. If you have used the services of web designers, digital marketers or the products of any other company, offer to write them a testimonial. They will include a link back to your website. If you comment on forums and blogs that are related the industry, we can help with your LinkedIn profile. Most blogs will allow you to leave your name with your comment, which also access the link. Forums will often allow you to have a signature area that you can use to get back into your website. Building your billing profile may take some time and it is something that will gradually improve. It’s an ongoing effort, and with these proven techniques, you can significantly increase the number of back links to your website. Remember to keep the links relevant always associate your backlinks with great content. If there is one sure-fire way of driving traffic to your website it is to run a competition. Obviously, the prize has to be appealing enough to cause a reaction. One of the conditions of the competition is to ask the entrant to give their name and email address. This gives you a mailing list you can use for marketing purposes and drive more traffic at a later date. If you are an expert in your field, sign up to HARO – help a reporter out. The website was established in 2009 so journalists can find reliable and authoritative sources for their articles. If you can persuade a journalist that you are the most qualified person to answer their question, you will receive coverage in high authority publications such as Forbes, Entrepreneur and Huffington Post etc. This tactic may not earn you a boat load of backlinks, but it will drive traffic to your website from a high-authority domain. Link building is an essential part of SEO, but you must be very careful that the practices you employ do not manipulate search results. Webmasters that attempt to cheat the system will be penalised by search engine updates. Matt Cutts from Google Webmasters talks about some of the ways you can increase the number of backlinks to your site. Is it just backlinks that will improve my website ranking? It is true that backlinks are a major part of Google’s algorithm for determining ranking. According to a report by Moz, some of the most crucial factors that Google uses to influence and rank websites are actually in direct correlation with backlinks. However, web pages which are highly relevant to the search query can still out perform larger websites with many more backlinks. Backlinks aren’t the only answer to ranking well in Google. This is where other SEO efforts come in. On-page SEO is so important. High-quality websites offer a lot more quality content that is relevant than poorly optimised websites. Remember that your most important web pages should never be more than three clicks away from your homepage. You should always check that you’ve used the relevant keywords within your web copy and consistency check for any broken links. You can also link pages to one another and remove any unnecessary outbound links. If you have pages with very little or irrelevant info on them, merge them with other pages as they won’t help your rankings otherwise. Improving your rankings isn’t just about backlinks. You need quality content too so that visitors and clients can find something useful to link to. To learn more about how to create great content that will boost your rankings naturally, speak to the experts at The Content Works. 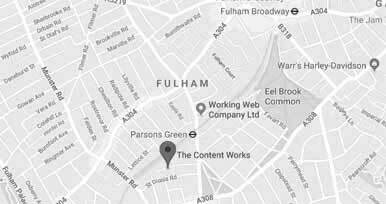 Give us a call on 0207 305 55 99 or email hello@thecontentworks.net for more tips and advice on how we can help you make your site the best it can be.